Memories of Childhood: Linguine with Clams! | Delicious! Delicious! Memories of Childhood: Linguine with Clams! CHILD CARYN, about 5, sits at a table flanked by her YOUNG MOM and her blond-haired, blue-eyed SISTER KRISSY, about 7. Her YOUNG DAD sits across from her wearing square glasses with thick black frames. All are dressed in the appropriate attire for a family in the late 70s: bellbottoms. Caryn and Krissy pick at the plate of pasta in front of them while their parents try to ignore them. Caryn sorts little pieces of indistinguishable seafood from the long strands. Caryn spears a piece of shrimp with her fork and sniffs it. Krissy does the same and both girls immediately recoil in horror. For the rest of their meal, the girls attempt to clean the pasta of any evidence of the sauce before sucking up one strand at a time. The traditional church with hard, mahogany pews is filled with the radiant light of the candles in the PARISHIONERS’ hands . The CHOIR leads the church in familiar Christmas hymns. Mom, Dad, Krissy and Caryn, dressed in festive velvets and taffetas, sing the chorus with full, wide-opened mouths. One by one, the FOLKS in the pew in front of the family turn around to see who is behind them. Mom and Dad seem to catch on to the unwanted attention before the two girls. Dad casually whispers to Mom at the start of the next verse. Maybe next year we shouldn’t have the chicken with forty cloves of garlic before the candlelight service. Caryn continues to grow up with every appearance. She wanders in wearing a neon orange sweatshirt with matching ribbons in her pigtails. Mom, now with a wavy perm in her hair, stirs parsley into a sauce on the stove. The drama queen spots the can of clams and staggers back. Same place, same Mom in a sparkly blouse, but Caryn’s pigtails are now gone and she’s a tad bit taller. A large stock pot simmers on the stove. Mom peaks in as Caryn tries to steal a look too. Caryn is alarmed at the mere suggestion. Mom flips off the lid. She scoops a little of the rich, tomato sauce into a bowl, leaving the chunks of pepperoni and sausage in the pot. I always like to have a little of the sauce with some bread for lunch. I like it better than on spaghetti. She hands Caryn a slice of white bread. Mom and daughter tear off a piece of their bread and dip it into the sauce, coloring it a bright orangey-red. Caryn tastes it. Mmmmm. I wish we could have spaghetti every night! Krissy, now the typical 80s teenager with big hair and colorful hoop earrings, walks in and sees them eating. Hey! How come nobody called me? Dad, older but wearing the same thick-framed glasses as before, stands at the counter opening the mail. Mom stirs a pound of linguine into a pot of boiling water. The sound of a car’s motor is heard from the garage off the kitchen. Before long, a teenage Caryn comes in and unloads her backback in the middle of the floor. Don’t leave that there. Take it upstairs. Caryn dejectedly picks up the backpack and stomps out. Motherrrr, why can’t we ever have meatloaf or mac and cheese like a normal family? Mom and Dad shrug to each other and continue about their business. A travel-weary Caryn drags her over-stuffed luggage up the steps of her front porch. She takes out her key to unlock the front door, but is surprised to find the door already slightly ajar. Mom is sitting on the couch watching television when Caryn enters. I thought I’d come visit for a couple days. Good thing, too, because you really left this place a mess. Caryn shoves the suitcases aside and plops down on the couch. You really could have given me a little warning before heading across the country to visit me. Caryn perks up at the thought of food. Mom goes into the kitchen. I learned to cook by watching my mother, who rarely made a bad meal. Originally from a Joy of Cooking recipe, Mom has made this quick pasta for as long as I can remember, much to the dismay of her children. She has adapted it over the years and often adds a dozen fresh littleneck clams to the canned. If using fresh clams, steam the clams in white wine by themselves in a pot with a lid. Make the sauce without the shrimp and add the steamed clams when you add the canned. 2. While pasta cooks, heat olive oil in large skillet until hot. Add minced garlic and cook gently 5 minutes. 3. Add parsley, clams, shrimp, oregano, wine and cayenne. Heat until bubbling and shrimp are pink. 4. Add sauce to hot cooked pasta and dress with parsley and lots of fresh parmesan. **This entry fulfills my obligation to the Memories of Childhood Meme for which I was tagged by Haverchuk. I’m now tagging Lisa at the new Lekker Lekker Lekkerste, Tara at the beautiful Seven Spoons and my buddy Danno at Cook’s Journal and Nola Cuisine (because he tagged me once before and I’m getting him back). Oh, YES!!! You can’t imagine how love simple white clam sauce. My own version has just clams (no shrimp but they do sound good too) and I heat everything including the clam liquor but only put the clams in for about 3 seconds before I pour it over pasta. It’s so easy for clams to get tough. That looks fantastic and I want some. How much heat does it get from the cayenne? fabulous! My favourite pasta!!! Linguini ala vongole!!! Thanks for the tag, Caryn will work on it ASAP! caryn! omygarsh! 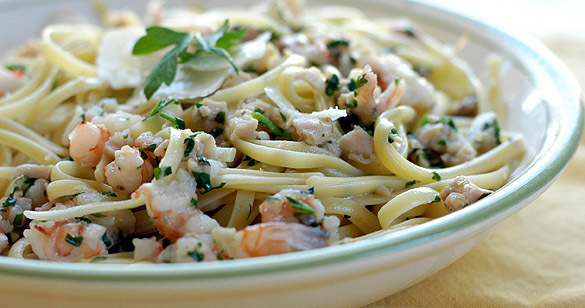 i totally have childhood memories of linguine with white clam sauce, too! lol! too funny!!! I turn my back and not only do I have a new story and recipe to read, but I have two! Thanks! Love linguine with clams. Made it last night, weird. Came in this morning to see your lovely picture of my dinner/left over lunch. If you don’t like it, it will just leave more for me! What a wonderful post. It was like watching a cute movie and eating my favorite dish all at the same time. Thanks to all of you for vaildating my mother’s choice to serve this to me day in and day out! Mom was disappointed that I didn’t make the version with fresh clams for the photo. Mzn, it doesn’t get much heat from the cayenne. It’s really just a slight “kick”, if you will. Sarah, I also laughed when I saw your childhood memories post and saw the clams!